New AL-Plastic Blister Packaging Machine, Model DPP-88. 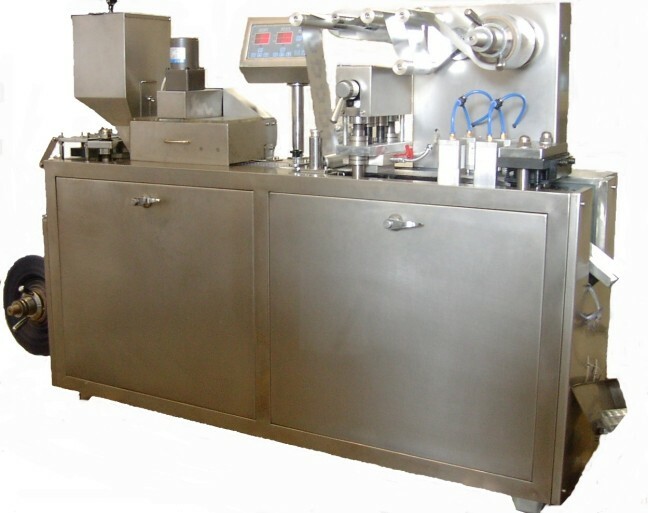 Features: variable frequency speed regulating, PC circuit control panel, travel type feeder for feeding capsules and tablets, mould spout (for replacing mould), suitable for small scale production. Comes with embosser for expiry dates, lot numbers, batch numbers, etc. Technical Data: Blanking frequency: 25-35 times/min. (AL/PVC) or 15-20 times/min. (AL-AL). Blanking Plate: 1-2 plates/time. Adjustable from 30 - 90 mm. Packaging Efficiency: 1200-2100 plates/hr. Max. Forming Area and Depth: 90 mm x 80 mm x 16mm. Specifications of packaging material: 88 mm x 0.25 mm or 88 mm x 0.15 mm, or 88 mm x .02 mm. Electrics: 1.8 Kw, 1Ph/60Hz/220Volts. Requires air to operate properly (compressor not included). Pressure: 0.5 Mpa. Dimensions: 1400 mm x 600 mm x 1200 mm. Weight: 380 Kg. Delivery Time: approx 8 weeks from receipt of a 65% deposit.